Poured Concrete Walls | Bassett Masonry, Inc. 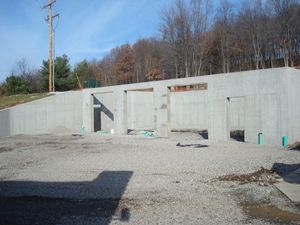 There are several reasons why poured concrete walls are the better choice for your foundation. Not only do they make for faster construction time and better re-sale of the home, but they also extend the construction season, as they can adapt to cold weather construction, which offers builders more time. Water tightness means a dry basement. More fire resistance, because of the density and joint free construction. Resistance to rot and decay, proven by the long years of service life that concrete walls have provided. Affordability. 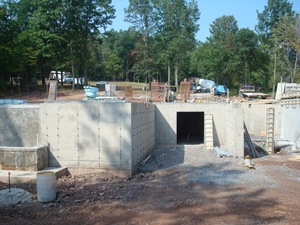 Poured concrete walls are cost competitive with block walls. homeowner of specified strengths in the concrete. Faster construction time....and the list goes on. For poured concrete walls, in Johnstown, Altoona, State College, Greensburg, Indiana, and Central Pennsylvania, Bassett Masonry can do the job! When your builder offers you concrete walls for your home, he's offering you the best!